Inlays and onlays are a leading restorative dentistry treatment, designed to improve the strength and appearance of damaged teeth. They can also be used to replace old fillings or treat new cavities. If old metal fillings have left you feeling embarrassed by the appearance of your teeth, inlays and onlays treatment may be right for you. In this post, Chicago dentist Jessica Emery provides an overview of inlays and onlays treatment. Inlays and onlays are tooth-colored fabrications designed to restore teeth damaged by decay. Inlays and onlays are made of either composite resin or porcelain, both of which can be shaded to seamlessly match the surrounding teeth. 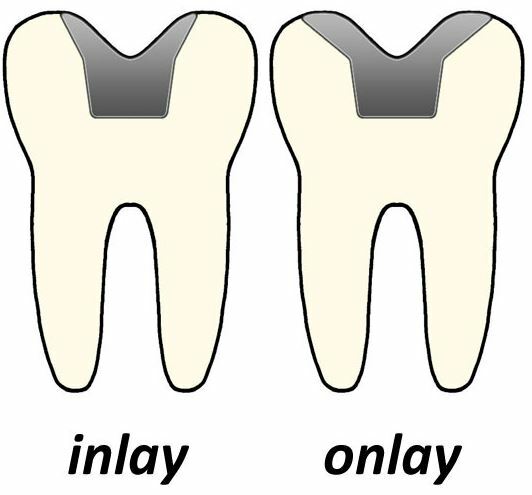 Inlays are used to treat dental decay within the cusps of the molars. Onlays are used when damage has extended beyond one or more cusps. Onlays may be used to treat extensive decay or partially broken teeth, which is why they are sometimes called partial crowns. Tooth-colored restoration: Inlays and onlays are tooth-colored, unlike traditional metal fillings. Custom-made: Each inlay and onlay is custom-made from impressions taken of the damaged tooth. Aesthetically pleasing: Because inlays and onlays are tooth-colored, they are virtually unnoticeable, blending with the surrounding teeth. Restores dental strength: Inlays and onlays add strength to teeth damaged by decay, whereas metal fillings can actually weaken teeth. Inlay and onlay treatment is customized to each patient, traditionally requiring two dental visits – one to take an impression of the teeth for creating the restoration, and a second to place the inlay or onlay. Thanks to CAD/CAM technology, Dr. Emery can complete restorations in a single visit. CAD/CAM technology uses digital imaging to create a 3D model of your teeth. This model is then used to mill your personalized restoration. The finished inlay or onlay is then placed the same day, avoiding the need for a temporary filling or a second appointment. Why Choose Inlays and Onlays Treatment? Inlays and onlays can restore the appearance of your teeth, eliminating unsightly metal fillings and restoring dental strength. There are many reasons to choose inlays and onlays to replace old fillings or treat new cavities. Tooth-colored inlays and onlays can improve the smile's appearance and give you the confidence of a flawless smile. Inlays and onlays are a better choice than silver metal fillings. Silver fillings are susceptible to expanding and contracting in the presence of hot and cold foods and drinks. This can cause the teeth to crack or the filling to fall out. Inlays and onlays are made of porcelain, which will not change in size when in contact with different temperatures, making them safer for your teeth. Metal fillings require extensive amounts of the tooth to be removed, including healthy parts of the tooth, weakening dental walls and making the tooth vulnerable to breakage. Inlays and onlays add strength to the teeth, requiring less of the tooth to be removed for placement in comparison to metal fillings. To find out more about inlays and onlays, or to see if this treatment can work for you, schedule a consultation with Dr. Emery today!